Today in NJ the Physician Assisted Suicide Bill passed the Assembly. This comes just weeks after Brittany Maynard committed suicide using the drugs that her physician prescribed for her. I am not going to say this is a simple issue or as some say, black and white when it comes to emotions. For me how we approach life and death is very black and white and most undoubtedly clear. It is very hard to watch our loved ones go through pain and suffer. Not for a second do I say it is not. I watched loved ones suffer and wanted to take it from, wanted to make it easier for them. I do not think there is anyone who would not want to do the same. So, then why not allow them to make a decision? Why not let them end it on their terms? Why? Well, we are not God. When we decide when it is time for us to leave the living world we are saying that we are God. We make the choice when and how we take our last breath. We are saying that there are no chances of a miracle. That God can not change anything. That we have more power then God. The fact of saying and believing that there is no hope scares me. We reduce how God can save us. Now, do not get me wrong. I do not live in a dream world where God saves everyone who believes or because one person prays more or that more people are praying for one person then another. I do not know or understand why someone is healed and another one is not. I wish I could explain it and make it clear and ok for everyone. I just can not. Yes, there are guidelines for when this law can be used and not. Yet, there are loopholes as well. Now again, do not think that if there were no loopholes and the guideline were extremely clear that I or the church would be in favor. That is not going to happen. Many people feel this law is just and protects the rights of the sick and can only be used for the terminally ill. Who determines this? Who determines what is quality of life? Who decides when one day a life is a life and the next a life that is to end? This law starts a path on a very slippery slope and a path that only can end in disaster. Where does it end? Who decides the limits? When does one say your life is not worth continuing on? If you do not think that will happen, you are fooling yourself. Someone feels that if they ever become a paraplegic then their life is not worth living. I lose my arm or a leg, my life is not worth living. I become reliant on others to help me dress, eat and bath, my life is not worth living. I have downs syndrome, my life is not worth living. Then it becomes those who are watching and caring for loved ones. They start to say they would not want to live this way, they need to end their life and I am speaking for them because they lost their voice or function. Do you really think this will not happen? This idea already was used by someone. Do you know who? Hitler. Hitler felt those who’s lives that were not up to par should be killed. You now say, Come on thats a stretch. Really? I hope and pray you are right and I am wrong. But, I will not stand by and just watch this new attack on the sanctity of life go without objection and allow it to just be. We have to stand together united to save all life. From Conception to Natural Death. We are not God and need to allow God to work. I ask us to pray and vote to save lives and not end them. I know this is not an easy thing for us to do. To look past all the pain and suffering and to see what is beyond it. To see a God who is there to help our loved ones and those who are there by their side. 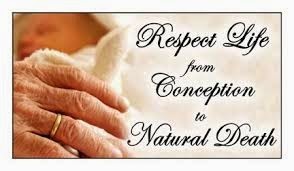 Until tomorrow, God Bless, and may we protect all life, in all stages, from Conception to Natural Death.